The intestinal tissue is continuously exposed to large amounts of microbe– and food–derived molecules that can stimulate immune responses. In order to contend with both harmless and potentially pathogenic stimulation, efficient protective responses against invading pathogens (resistance) must be coupled with tolerance. This includes peripheral tolerance, i.e. a cell-intrinsic or -extrinsic process that prevents pathological immune reaction against non-self antigens; and disease tolerance, i.e. control of inflammation- or pathogeninduced tissue damage1-3. Several cellular and molecular mechanisms exist to ensure robust tolerance induction in the mucosae, and disruption of such processes often leads to severe chronic inflammatory pathologies, including colitis, food allergies and asthma. 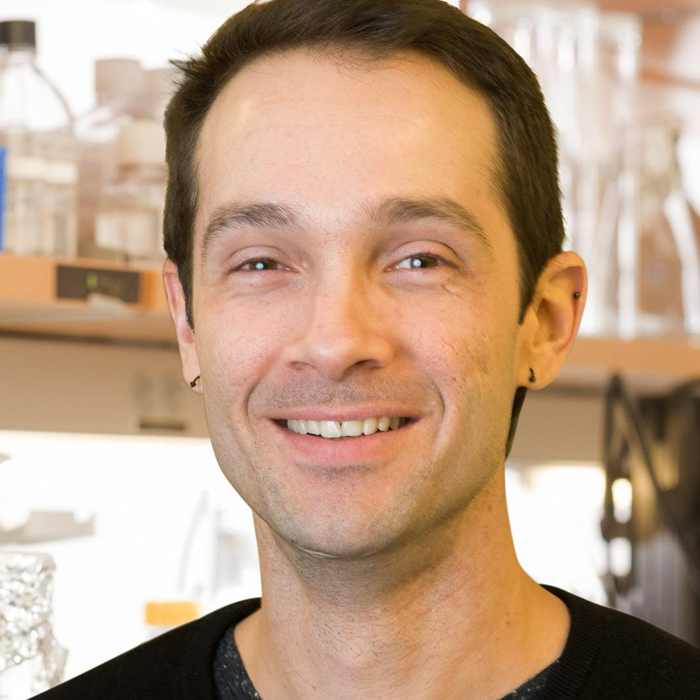 My laboratory focuses on the characterization of tolerance and resistance pathways that operate in the intestinal tissue, and on the consequences when these processes are compromised. We hypothesize that distinct signals within niches of the intestinal tissue dictate the pro- versus anti-inflammatory function of immune cells. Our efforts are dedicated to identifying gut-specific environmental cues and understanding how they influence the development, localization and intra-tissue specialization of immune cells involved in resistance and tolerance mechanisms (Fig.1). Specifically, we study how the epithelial milieu, directly exposed to luminal stimulation, coordinates the function of immune cells occupying this environment (topics 1 and 2). Our studies have demonstrated previously unappreciated levels of plasticity in lymphocytes upon migration to the epithelial layer and defined molecular mechanisms and environmental cues responsible for intraepithelial lymphocyte differentiation and function4-8. 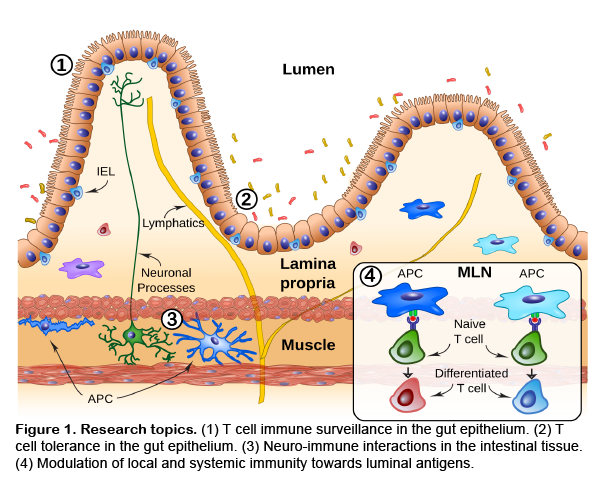 The intestine also hosts a large number of neurons (enteric-associated neurons, EANs), which extend projections towards the intestinal villi and distal sites to control a variety of functions within the gastrointestinal (GI) tract. We investigate whether neuro-immune interactions in the intestine modulate tissue-protective responses to local and distal perturbations (topic 3). Our work indicates that EANs play a role in sensing luminal perturbations and providing specific signals that direct the fate of gut macrophages9 and additional immune cells. Reciprocally, our published and unpublished data suggest that immune cells surrounding EANs play an important role in regulating processes such as neuronal repair and behavior. Finally, we are interested in defining cell-dependent and acellular mechanisms by which luminal stimulation influences systemic immune responses, and the consequences when these mechanisms are disrupted (topic 4). Our studies helped define innate immune cells that modulate the differentiation of anti-inflammatory T cell populations in the gut-draining lymph nodes, influencing systemic immunity6, 10. We are interested in defining cell-dependent and -independent mechanisms that mediate the transfer of luminal antigens and metabolites to systemic sites. Click here for more recent publications.